Beautiful certificate from the Collector of Baltimore issued in 1798. This item is over 216 years old. After the adoption of the Federal constitution in 1789, Robert Purviance was appointed the first Naval Officer of the port of Baltimore. 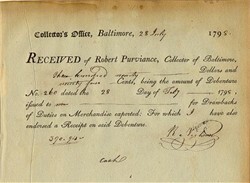 With the death of Otho Holland Williams in 1794, Robert Purviance moved into Williams' position as Collector of Customs and held that position until his own death in 1806. In addition to his duties at the port of Baltimore, Robert was also highly influential in the establishment of the First Presbyterian Church in Baltimore.